QUALITY WORK SINCE 2002. LIFETIME WARRANTY. 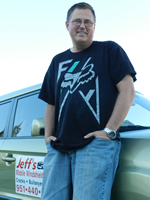 Jeff Matuzak is the owner operator of Jeff's Mobile Windshield Repair. He has been doing quality windshield repairs for 13 years in the greater Temecula Valley including Fallbrook, Rainbow, and Lake Elsinore. Call him at 951 440-8794 to schedule service or to ask a question. Jeff is licensed, certified, and is C.H.P. (CA Highway Patrol) and D.O.T (Department of Transportation) approved. Jeff is authorized to fix cracks on big rigs, RVs, motor homes and large commercial vehicles. Call for pricing. Jeff is available 7 days a week from 8 am to 9 pm. He gives a lifetime warranty on his repairs. Q. I'm worried about someone trying to talk me into replacing my whole windshield. A. My approach to windshield repair is to permanently fix what’s fixable. If I can fix it, I will -- and will guarantee my work for the life of your car. I don't install new windshields so you can be confident I am not trying to upsell you to a new windshield. Keep in mind that I’m not here to sell you glass. That means that I have no interest urging you to replace your windshield unless it’s totally necessary. Some auto glass companies would rather sell you a windshield than repair a chip or crack. Because I do only repairs, I do more of them than most other shops -- so I have more experience than most of the other guys. I’ll repair your windshield correctly with the highest-quality resin and tools available. Q. My insurance company gave me a number to call to help guide me through the repair. Do you know anything about that? A. Beware of what is called "steering." State insurance law forbids insurers from forcing you to use a particular shop or company. You have the right to choose the shop you want: click here for background on the law. Warnings like that are a ploy. Again, you can use whoever you want. Jeff’s Mobile Windshield Repair is CHP- and DOT-certified, and I offer a lifetime warranty. I’ll do the job right -- and I back my work. A. I accept insurance and will process the claim for you. Under comprehensive coverage, most insurers waive the deductible and will not increase your premiums. You'll pay no out-of-pocket costs for up to three chip repairs. In effect, your windshield repair will be FREE! Please scroll down for full CONTACT section where our email form is located. Or, just call us now.